The front cover of the December 1st, 1979 edition of The Citizen held the surprising announcement that the Cinema House would be closing its doors “for an indefinite period” after the weekend’s showings. The article cited several reasons for the closure, most notably the lack of a replacement for long-time manager Jack Humphries. Humphries was retiring after managing the Cinema House for 51 years. The closure was also the result of financial issues for the cinema. Alan C Caithness, Secretary for building owners St Andrews Cinema House Limited, said that “the cinema industry in general has been having a tough time for years” and pointed to losses over the last 10 years for the Cinema House as a major reason for not continuing the venture. And, despite the involvement of the University in the opening in 1913, Caithness cited a lack of student patronage as another factor. “Students don’t seem to go to the cinema as often as they used to,” he told The Citizen, which contributed to poor ticket sales during term months. An issue not raised by the announcement in The Citizen was competition from other cinema houses in the area. When the Cinema House opened its doors, it was the only cinema built expressly for the purpose of showing films in St Andrews. 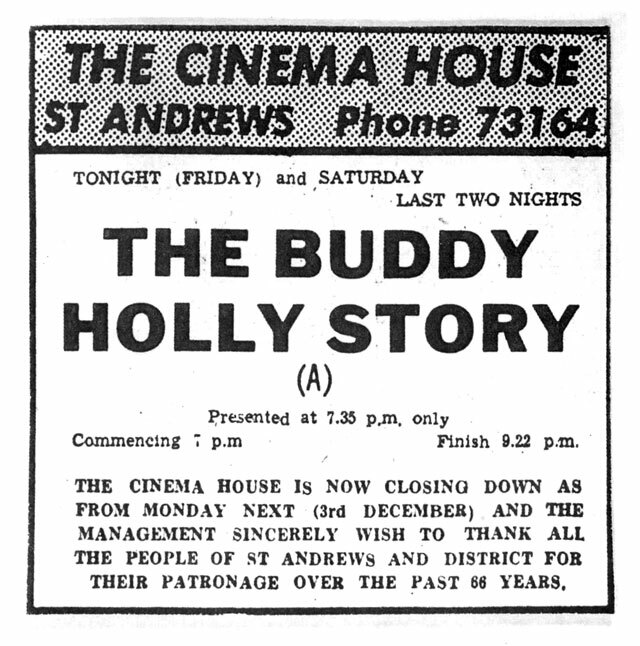 By 1979, however, the number of cinemas in surrounding areas had grown exponentially, including The New Picture House, opened in 1930 directly across the street from the Cinema House, and the more recent opening of the first dual cinema in Scotland in Dundee. Aside the front page story in The Citizen, the Cinema House closed quickly and quietly. Along with their weekly advertisement in the entertainment notices that week, listing The Buddy Holly Story as the final film, a short closing notice thanked patrons and staff for their support. While the closure ended up being permanent, there still seemed to be hope for the building to find new life. However, rumours of a bingo hall taking over proved false, and after the university failed to muster support for its purchase, the Cinema House was demolished in the 1980’s and replaced by residential flats.